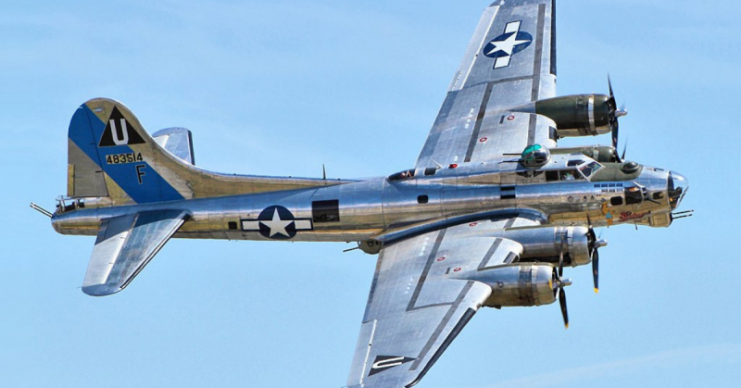 From the day of its maiden flight 83 years ago, the B-17 Flying Fortress has become the royalty of the skies. Made by the Boeing company, this four-engine heavy bomber got airborne for the first time on July 28, 1935. Just the day before, Seattle Times reporter Richard Williams had been lucky enough to see the heavily armored aircraft. 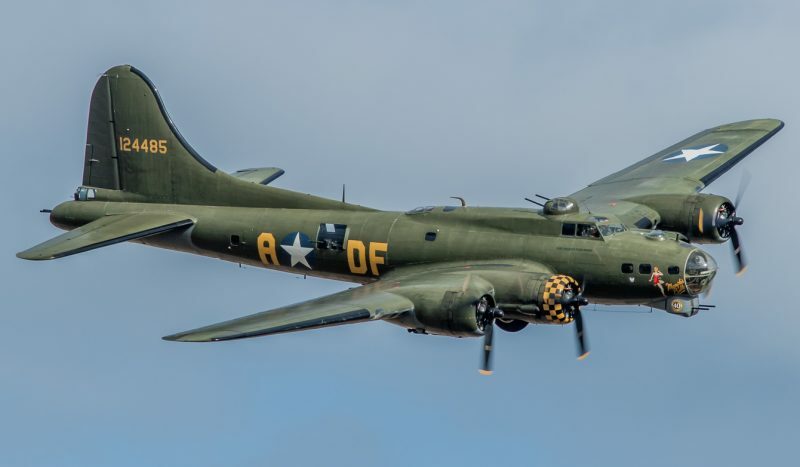 Spellbound by the sight of several .35 caliber machine guns fixed all over the plane, “Flying Fortress” was a description that sprang to his mind, and indeed, it was a fitting name. Below are some interesting facts about this magnificent aircraft. 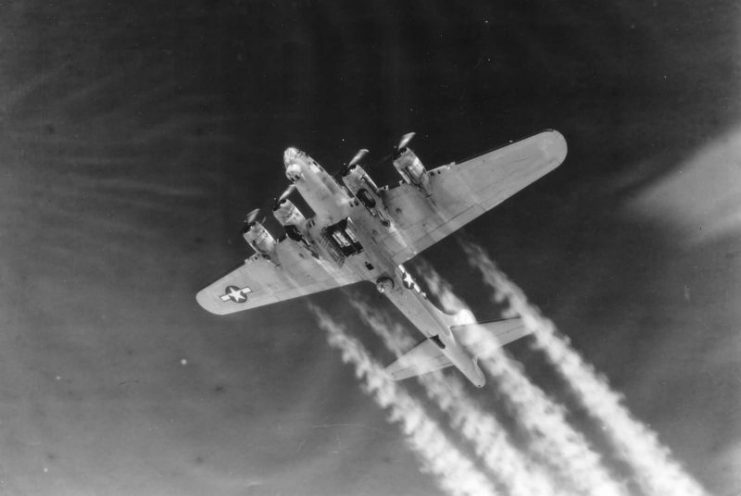 For all its accomplishments, the B-17 had a bad beginning. 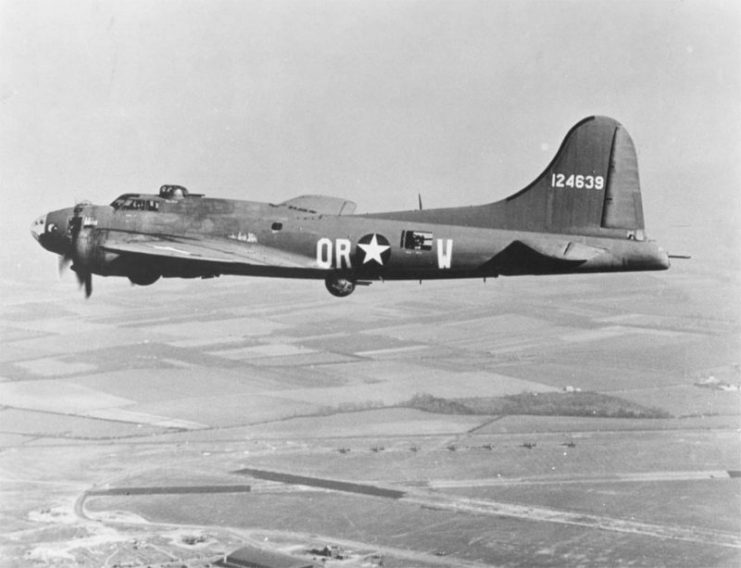 During a fly-off with two competing airplanes (DB-1 and Model 146), it was decided that the B-17 had shown more promise and was in tune with the recent USAAC philosophy. By the end of the first evaluation, the USAAC had budgeted for 65 B-17s. However, not long after that, a tragic event occurred. Firefighters working to save B-17 of 8th AF England, 1944. During a second evaluation flight, the B-17 experienced some mechanical issues while airborne. As a result, it crashed and both aviators of the aircraft were killed. 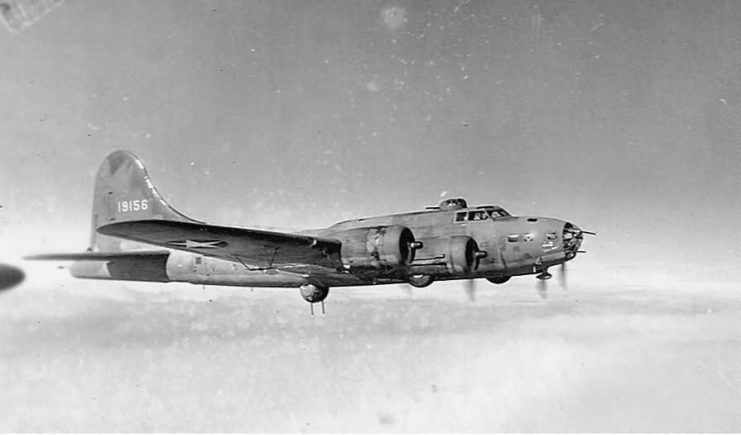 Ultimately, the B-17 did not complete the second evaluation. Owing to its high price and the fact that the Great Depression was at its height, the USAAC settled for the DB-1 which was relatively cheaper. Although the B-17 lost the contract, the promising features of the aircraft were too good to be overlooked. Consequently, the USAAC went through a special F-1 funding procedure in January 1935 and procured thirteen B-17s, as YB-17s. 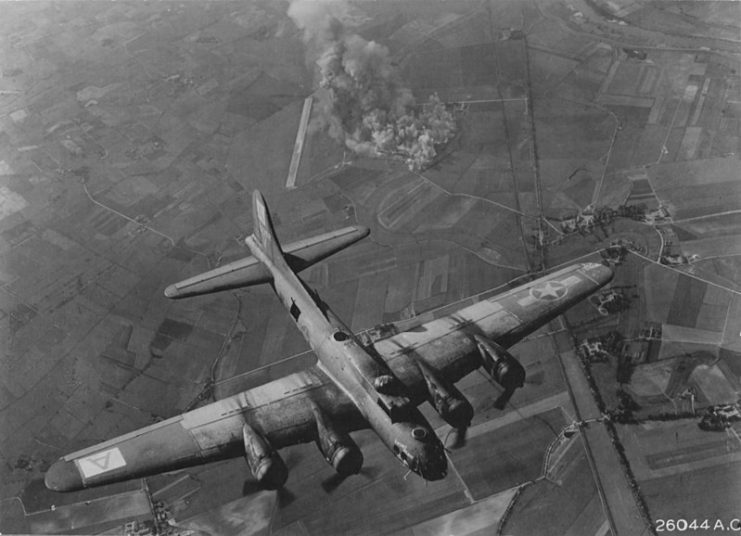 A B-17F of the 99th Bomb Group, with the nearly frameless clear-view bombardier’s nose. 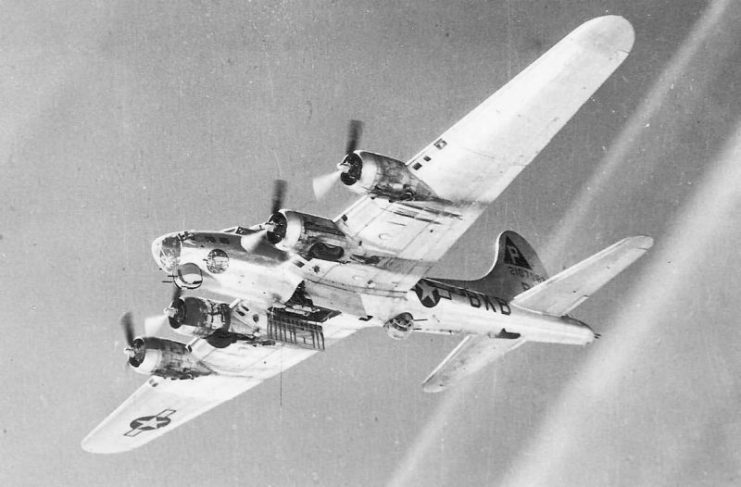 B-17G of the 452 Bomb Group with its bomb doors open. B-17G 44-6544 KWITURBITCHIN II of the 15th Air Force, 97th Bomb Group, 414th BS. This is doubly impressive because the B-17 was made to have a lesser bomb load while incorporating heavy defensive armament, high speed, and long range. 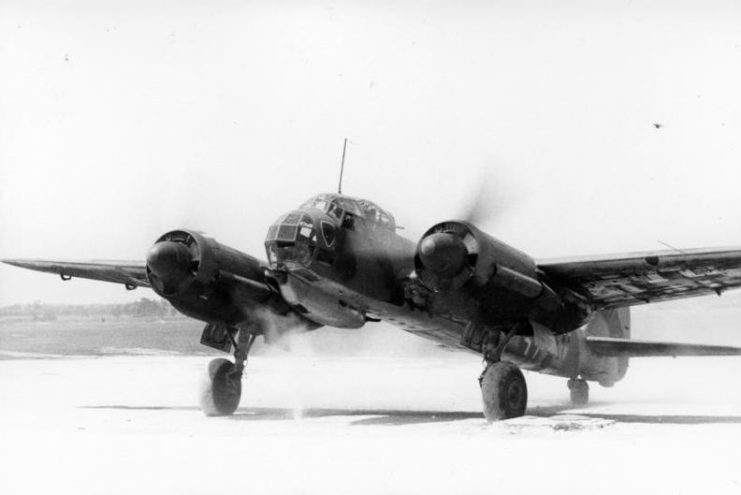 Its bombing ability was not the highest priority, even though it was a bomber, giving it a relatively smaller bomb load when compared to other aircraft. Boeing B-17F radar bombing through clouds. 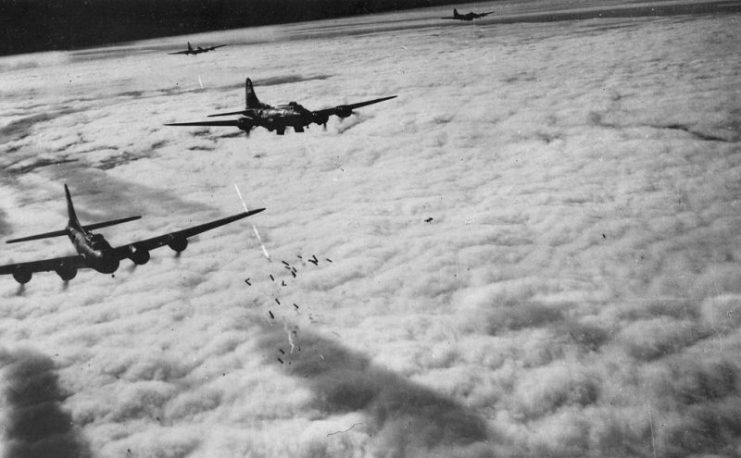 About 640,000 tons of bombs were dropped on Nazi Germany and its territories by the B-17, a significant percentage of the 1.5 million tons dropped in all sorties against Nazi Germany. This was an operation which involved flying unmanned bomber aircraft into highly fortified, bomb-resistant targets. Aphrodite B-17F (The Careful Virgin). However, this mission was largely unsuccessful. 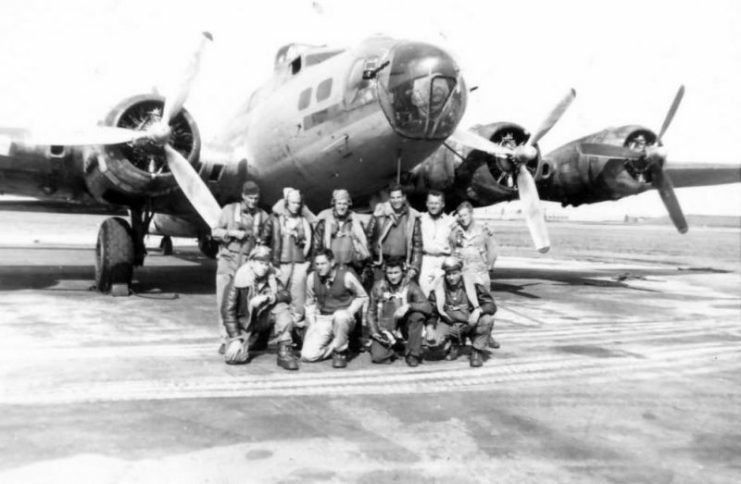 Several B-17 aviators were honored with military decorations. 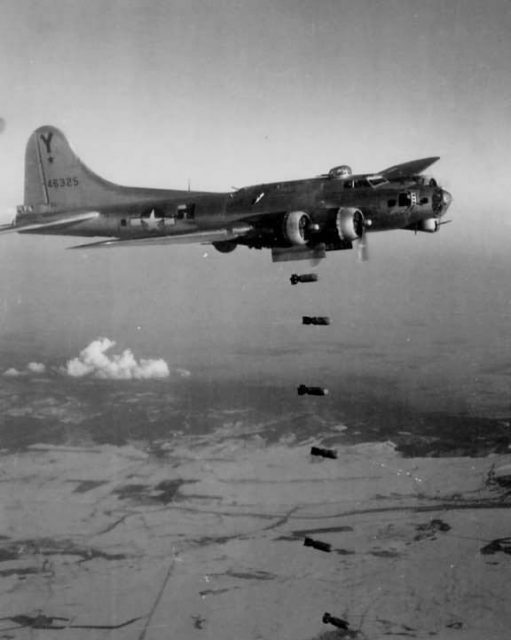 A total of 17 Medal of Honor awards were given to B-17 crewmen, many of which were awarded posthumously. However, by a long margin, crews of the Boeing aircraft have received more Medal of Honor awards than those of any other American aircraft. 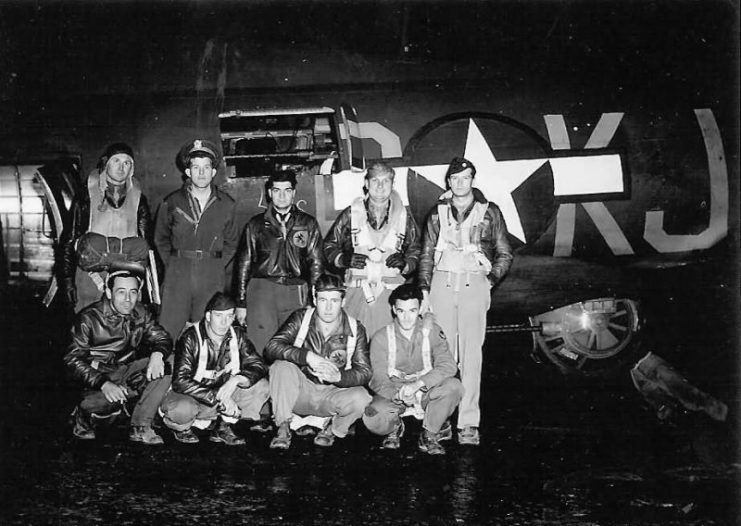 USAAF Crew poses at night time by their B-17 Bomber. B-17F Flying Fortress and Crew, 8th Air Force. This is a name given to a B-17 Flying Fortress which had gone head-on against a German Bf 109 aircraft several feet above the ground in Tunisia. The German Bf 109 had rammed itself into the All American, severely damaging it. The rear fuselage of the All American was nearly cut off, but the pilot was able to fly the aircraft safely back to the base in Algeria. Boeing B-17E Flying Fortress Eight Ball Of The 394th Bombardment Squadron 41-9156. 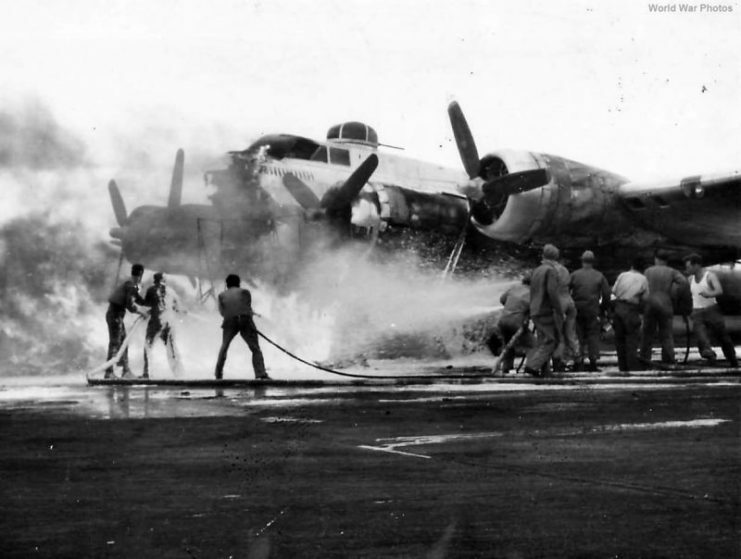 This was a good demonstration of the durability of the Flying Fortress which managed to fly back to base without falling apart after the severe collision. This was a B-17 Flying Fortress which was paid for by the city of Seattle. Its last flight was during a reconnaissance mission on the 14th of August 1942. During this mission, it failed to return and was declared Missing in Action—MIA. Its crew was officially pronounced dead after three years. Boeing B-17G-35-DL 42-107083 BK-B of the 384th Bomb Group, 546th BS, 1944. 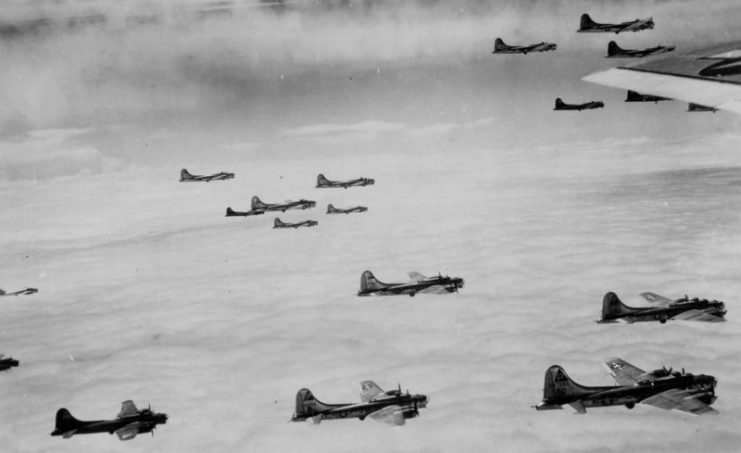 About 40 B-17s were captured and modified by the Luftwaffe to suit their specific needs. About a dozen of these downed planes were successfully put back into the air and were used by the Nazis against the Allies. 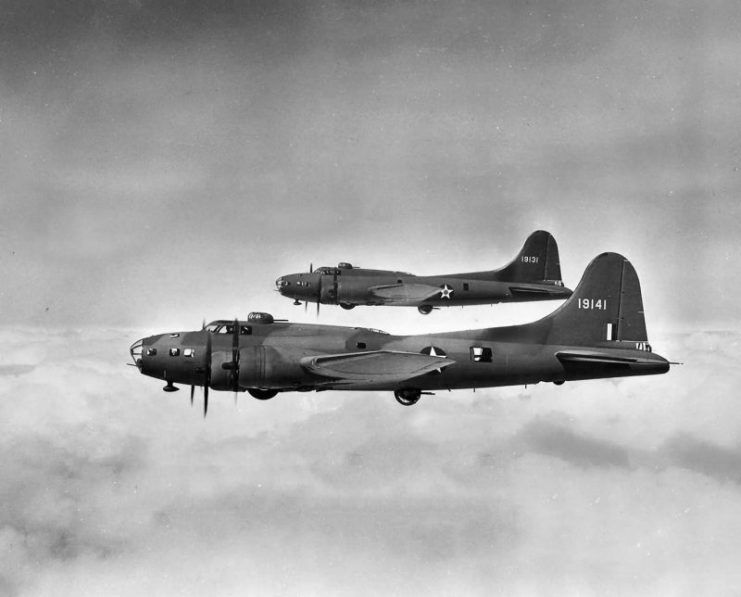 Captured B-17s were analyzed by the Germans and the plane’s weaknesses were determined. Such knowledge would be incorporated by interceptor pilots while attacking Allied B-17s in future engagements. Three downed B-17s were also repaired and restored to flying status by the Japanese. 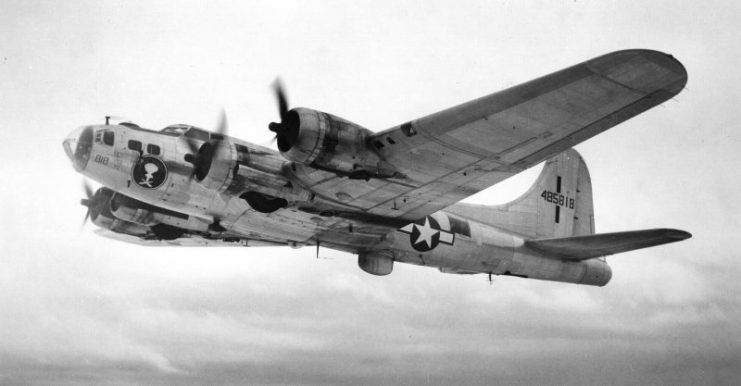 About 12,732 units of the B-17 Flying Fortress were produced between 1936 to 1945. It is ranked third in a list of most produced bomber planes of all time, beaten by the Consolidated B-24 Liberator and Junkers Ju 88. This was a mission carried out only by B-17s. 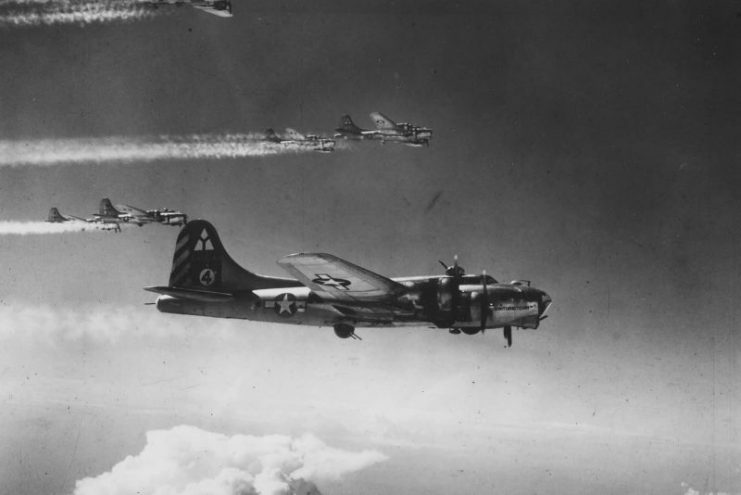 A total of 376 B-17 bombers were used on this ambitious expedition, aimed at crippling the German aircraft industry. 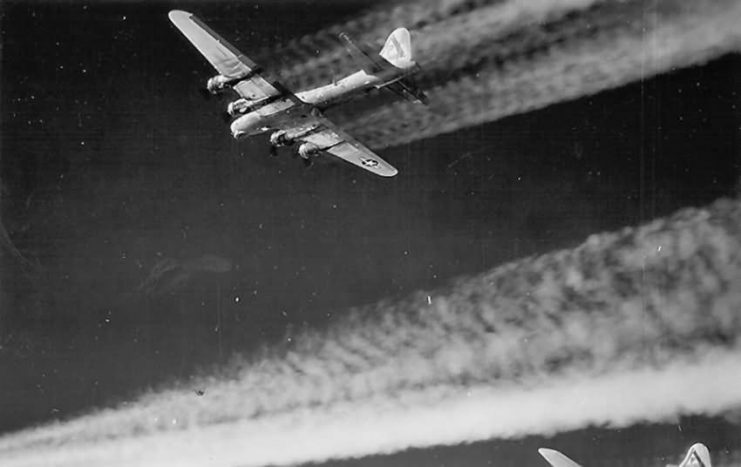 383rd Bomb Group B-17G releasing its bombs over Vienna on February 7, 1945. However, this turned out to be a serious failure. 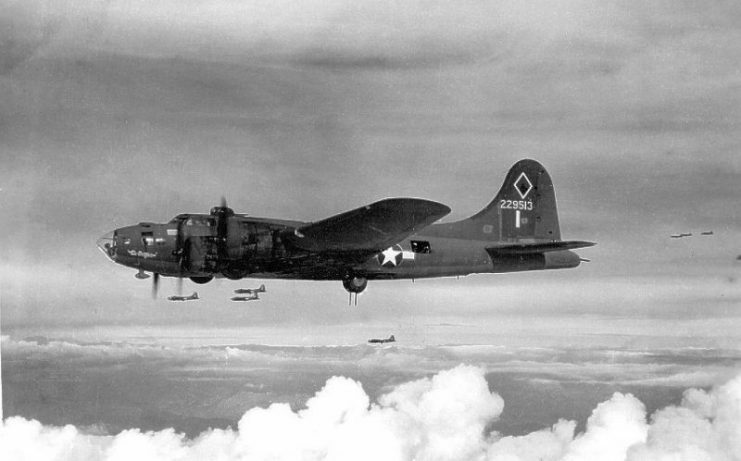 The USAAF lost about 60 B-17s in this mission, and over 550 crewmen were declared MIA. The Germans incurred heavy losses too but nevertheless won in this instance. 384th Bomb Group 8th AF B-17 Bombers in the Combat Box. The B-17s have long been decommissioned. 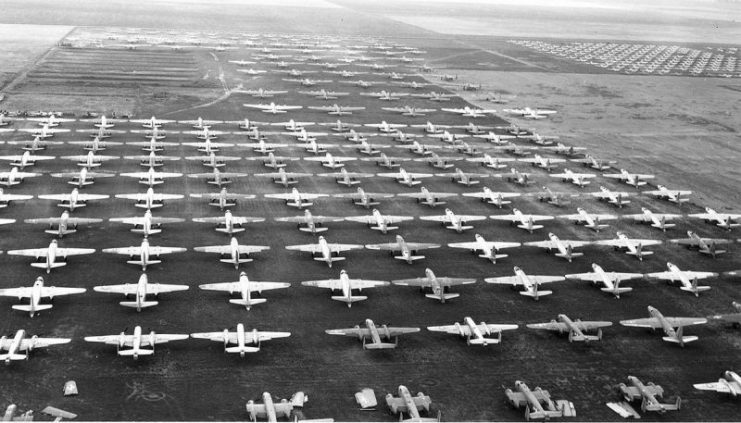 Out of the massive number of B-17s produced, less than 15 are still flying. 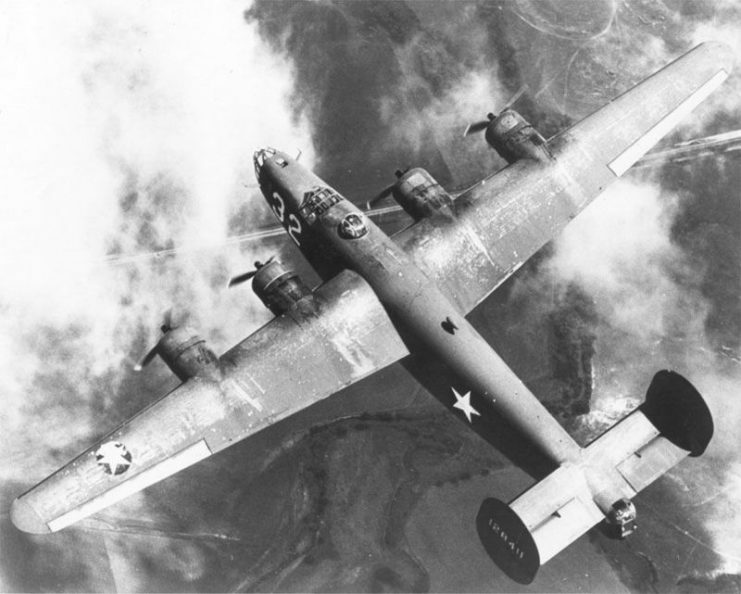 However, in its day, many pilots compared it with the B-24 and declared their preference for the B-17 owing to its stability and durability. 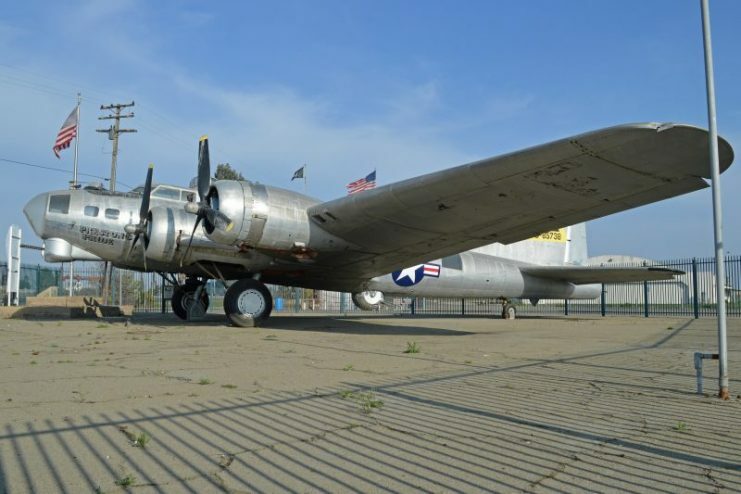 They claimed the B-17 Flying Fortress could still fly better than the B-24 even if it had one damaged engine.